Derma Micro Needle Roller for Cell Regeneration, Scars, Pimples, Blemishes, Facial Wrinkles and Lines, Pores. With the 3-in-1 derma roller you can see a difference in just a few days. 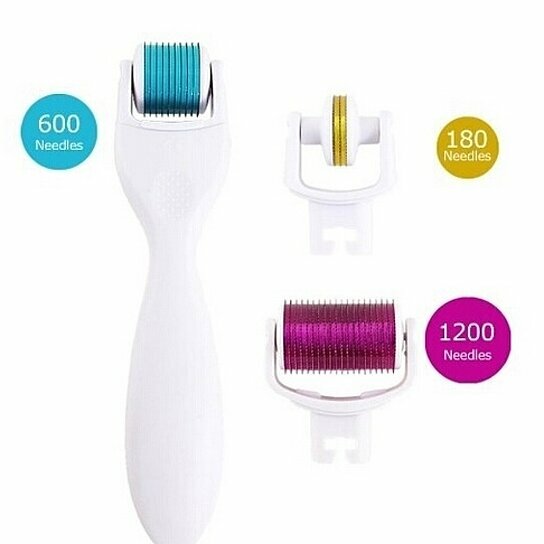 The 3-in-1 derma roller naturally, painlessly, and safely stimulates collagen and elastin production below the skin's surface, where wrinkles begin to form. Results improve with extended use. Three separate rollers with different length & needle counts made of sterilized titanium micro-needles address all skin types and problems. 1. 1200-needle 1.5 mm length head (for use on body) helps reduce scarring, stretch marks, cellulite and sagging skin. 2. 600-needle 1.0 mm length head (for use on face) helps reverse the signs of aging on the face. 3. The delicate 180-needle 0.5 mm length head (for use around eyes) treats the sensitive skin of the eyelids and lips. All heads have sterilized titanium needles. SUGGESTED USE:The size of the roller depends on the skin's (epidermis) thickness of treated area. The needles are not supposed to reach the dermal (dermis) level deeper than 0.5mm. Skin thickness varies from tens shares of millimeters to 4 millimeters.